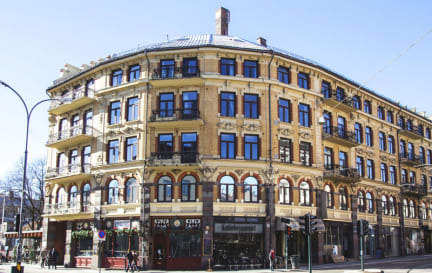 Cochs is a good and popular pension, centrally located right behind the Royal Palace. Cochs offers a friendly atmosphere with clean and tidy rooms. The 88 rooms are offered in three categories: Best rooms, Standard Rooms and Value Rooms. Some of the Best Rooms and Standard Rooms have a kitchenette, others have a boiler and fridge. The Value Rooms have a bathroom in the corridor and no cooking facilities. Breakfast is not included. 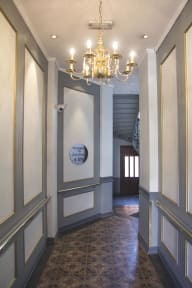 However, most rooms have a small tea kitchen, and guests can buy breakfast packages at a special price at Kaffebrenneriet on the ground floor. Cancellation policy : 18.00 the day before arrival. Credit cards accepted (except AMEX). For a party of four, it was an outstanding visit. The staff, especially Victoria were fantastic. The one draw back was there could be a soap dish in the shower. We would definitely stay there again on our next visit. After a long day of travel it was nice to get quickly checked in to our room. The surroundings were modest, yet very comfortable. Cochs Pensjonat was excellently value for us during our stay in Oslo. Clean and has a great location. My friend and l stayed here for 2 nights and we were very happy with the accommodation it was clean and tidy the staff were very helpful. l would definitely stay here again Oslo was a beautiful place to visit. Great location, friendly staff. Room was basic, but clean and compfortable. The breakfast each morning, a ham and cheese sandwich along with a juice, hung on your door was fine. If you want more, there are plenty of options around. Stayed in a twin room with shared bathroom. Good value for money, only thing is the bathroom lock is a bit flimsy! Also, the showers could do with another shelf. Security was good as keycards were used for entry to both rooms and the front door. Rooms were clean and staff were friendly and helpful. I wish they had a laundry but the staff did show us a laundry that picks up and delivers. Location was ok, close to the Royal Palace but a little far from the other attractions. Having a good stay here. This place looks like a hotel rather than hostel. Great - all the reviews are spot on, but what they don’t say is that it is very near several bars and on a Friday night when we stayed the screaming and shouting in the street started at about eleven and finished at about 4 am. Add to that police cars, taxi drivers sounding their horns we had no sleep. The hotel is everything it says it is but a hostel it isn’t. There is zero atmosphere, no facilities and over all it is like staying in a hospital ward. Good for some but not for me.